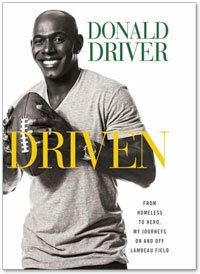 According to pre-sale orders, former Green Bay Packers wide receiver, Donald Driver’s memoir, “Driven: From Homeless to Hero, My Journeys On and Off Lambeau Field,” has already become a bestseller. Driver, a Super Bowl and ‘Dancing With The Stars’ champion, plans to promote and autograph his book with a series of scheduled book signings. Driver’s next appearance is October 25, at the Barnes & Noble store located at 7433 Mineral Point Rd, in Madison, WI. The event begins at at 9 a.m and is free to the public. Fans will stand in line after be being given a number. “A great teammate…That he could go from a seventh-round draft choice to the Packers’ all-time leading receiver is a real tribute to him.” – Brett Favre, Packers quarterback, 1992-2007. Watch Donald Driver “Driven to Achieve Awards’ video and how he gives back. Driver was an NFL wide receiver for the Green Bay Packers from 1999 until 2012. He holds the all-time team record for receptions and receiving yards. He is both a Super Bowl and “Dancing with the Stars” champion. He is a role model on and off the field and has received multiple honors for his service to the community, including the charity he started with his wife in 2004 to provide assistance for homeless mothers and underprivileged children. If you would like to book athletes like Donald Driver for a speaking engagement, appearance, endorsement or corporate event, contact our booking agent for appearance and speaker fees or call 1.855.303.5450.